Rocksteady Games confirmed that there will be no multiplayer component, coop or otherwise, in Batman: Arkham City. The first Batman game from Rocksteady, Arkham Asylum was The Escapist's 2009 Game of the Year for how well it blended atmosphere and setting into a frightfully accurate portrayal of the Dark Knight. 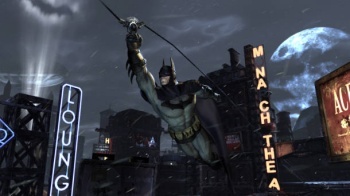 For the sequel, Batman has a much larger area to explore in Arkham City, but in order to preserve the single player experience, the game will not offer any multiplayer. That means no competitive deathmatches, no persistent world, and no cooperative play. Sefton Hill from Rocksteady, acknowledges multiplayer is the direction that many AAA games veer nowadays but that it just didn't make sense for the game he was trying to make. Despite what the rumors have been saying, Hill dispelled all myths of a multiplayer experience in Arkham City. "There have been a number of rumors circulating about a multiplayer mode in Batman: Arkham City so let me start by saying, once and for all, that Batman: Arkham City is a 'single-player only' experience," Hill said. Why abandon what could give the game significant replay value? "Our thought process behind this was fairly simple: when we investigated adding multiplayer we asked, 'If we use all of the energy that is required to create multiplayer and instead focus this on the single player, would that deliver a better overall game?'" As Hill and Rocksteady are now entering the final push of development, he knows that he would not have been able to make a great game with both a single player and a multiplayer portion. "It might not be the fashionable choice, it might not get us an extra tick on the box, but we are convinced, and we hope that gamers will agree when they get to play the finished game, that we have made the right decision," Hill said.